Your weakness is your strength! Cliché? Yes, but like many clichés, this maxim contains an element of truth, since every imperfection presents an opportunity for improvement. When it comes to swimming, ironing out wrinkles in your stroke can yield huge dividends in terms of improved efficiency and lowered splits. 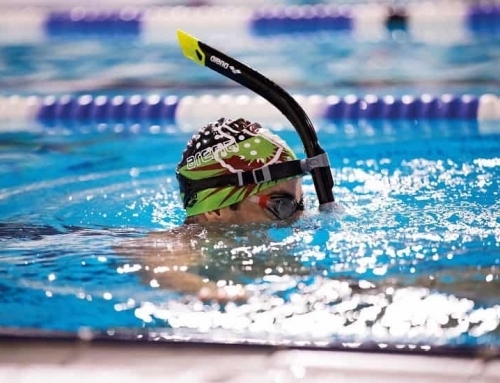 Regardless of your level of proficiency in the water, improvement is always an option, the most talented swimmers can improve by continually tweaking and refining their strokes. The off season is the time to spend on technique not yardage. Before we can discuss technique, we need to go back to the most basic element in swimming, breathing! 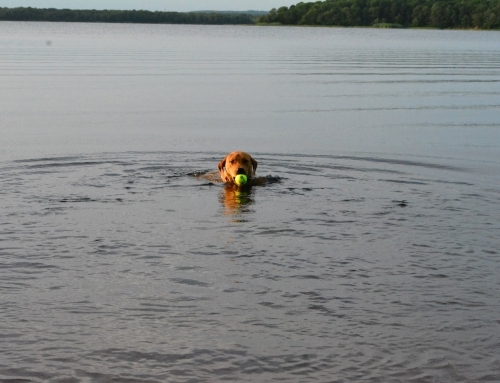 This is generally where most problems begin in the water. When you’re swimming freestyle, it’s critical to exhale when your face is in the water so you are able to take a full breath when you roll to the side. Do not think about the inhale, unless you have gills, you will always inhale when you rotate your head, it’s a natural reaction. When swimmers say they swallow water, 9 out of 10 times it has to do with timing, not forgetting to inhale. 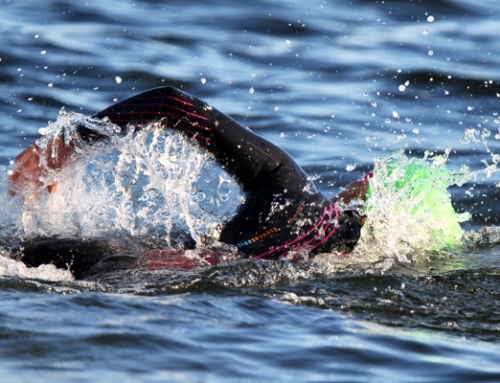 However, because they can’t relax in the water, many swimmers resort to holding their breath or partially exhale, subsequently they cannot take in a complete lungful of air. This starts the downward spiral to panic, these swimmers have to breath every stroke, they go hypoxic very quickly, and tire not from the effort but merely from lack of oxygen. The way I like to begin correcting this is in our warm up and cool down. Here the swimmer is relaxed enough to smooth out breathing using certain drills to help with technique. Crossover is a problem for many swimmers. I find the main reason is because they do not realize they are doing it. We use video analysis in our clinics for this very reason. If I had a quarter for every time a swimmer has said to me “I thought I was doing that”, I’d be a rich woman today. Crossover happens when your hand enters the water at the beginning of each stroke and passes through your midline. It is important for swimmers to not cross the body’s imaginary midline running from head to toe. Crossing over puts strain on the shoulder joint and makes your body fishtail or swing through the water, increasing drag. 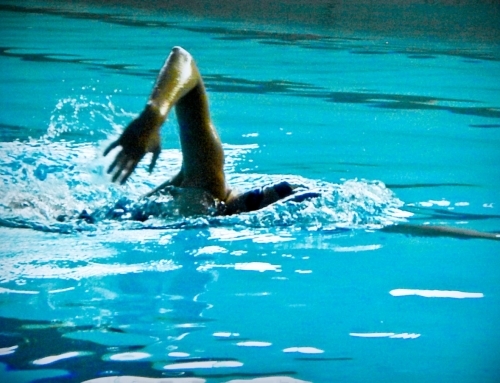 An early hand entry at the beginning of each stroke in most cases causes the swimmer to cut through the water in a downward motion, usually next to the head. The swimmer needs to focus on extending the arm forward near the surface. 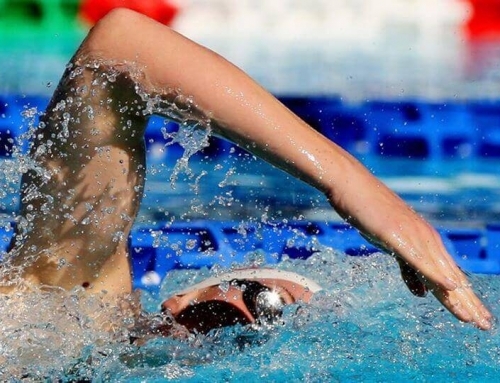 The down-motion of the arm causes the swimmer to pull through with a straight arm generating very little power in the most important part of the stroke, “the catch”. If swimming short distances is your thing then a short finish will boost your stroke rate, but since most of the swimmers I work with are swimming longer distances, the full extension at the end of the pull phase of the stroke is more efficient. When the swimmers triceps get tired the natural reaction is shortening of their stroke, pulling their hands out of the water to early, at their waist rather than by their upper thigh. As your arms complete their underwater pull, strive for a fully extend arm behind you, by your side, so that your thumbs graze the side of your thighs below your suit-line. Too often I see swimmers begin bending their elbows the end of their stroke, they pull their arms out of the water before allowing them to finish their path. Shortening your stroke results in a less of efficient stroke, uses more energy because the swimmer is taking more strokes per lap (essentially spinning their wheels). Many times, swimmers drop their elbows after their hands enter the water in the beginning of each stroke (remember the elbow should be high while the fingertips point down at the bottom of the pool (“over the barrel”). This freestyle flaw zaps more speed from the swimmer then any of the other mentioned flaws. This happens because all of your power and speed come from under the water. In simple terms all your force is being directed down instead of pushing the swimmer through the water. What the heck is that? I like to call this “flat” swimming. Basically the swimmer does not rotate from side to side. Very common with triathletes because cycling and running are forward motion sports with little rotation. Consequently the pull is shortened, the length of the stroke becomes shorter, and drag becomes an issue. If you do any of these try to back down on your yardage, and focus on technique or you might want to join in on one of my swim clinics!